Ideal for use in larger and high-traffic care homes and nurseries, the BSI First Aid Kit in Medium has everything your business will need to deal with injuries and wounds at the work place. Compliant with BS EN 8599-1, this kit has been devised by the British Healthcare Trade Association and has been packed with quantities designed to reflect the number of potential accidents likely to occur in the workplace. 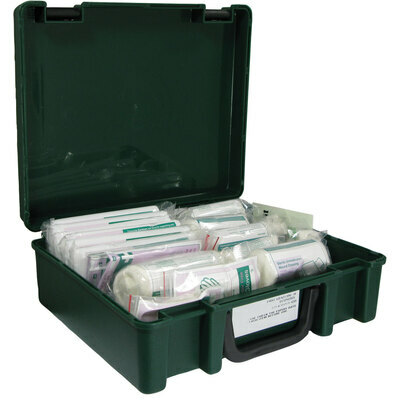 The kit can be easily mounted to the wall, ensuring every appointed first aid care giver can locate the appropriate equipment easily and, with its all plastic construction, the case is easily sanitised with antibacterial sprays or wipes. A professional looking kit that also serves a wide range of services in both low and high-risk environments. For those requiring smaller kits, we also stock a range of Travel and Compact BSI compliant First Aid Kits in our First Aid & Medical Supplies category.